The Fluke 62 MAX+ Dual Point Infrared thermometers is good at many things; accuracy, distance to spot, adjustable emissivity, and high-low alarms. The Fluke 62 Max Plus is rugged, accurate, easy-to-use test tools are dust, water and drop resistant, making them ideal for the harsh conditions faced by technicians in electrical, service, HVAC, process, industrial and facilities maintenance applications. 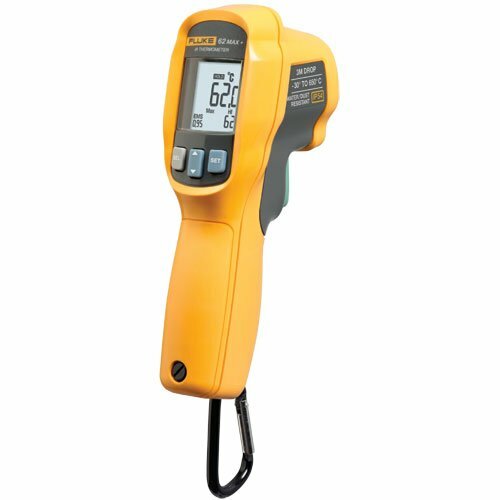 The Fluke 62-Max+ is ideal for quick temperature scans of systems to look for anything from unusual hot spots that signal electrical and electro-mechanical malfunctions to undesirable air intake/output patterns in the building envelope. Because infrared measurement does not require making contact with the surface being measured, technicians can make the measurements from a distance, away from moving machinery or live electrical connections. The Fluke 62Max+ has a distance-to-spot ration of 12:1 and measures 30°C to 650°C with an accuracy ± 1.0% of the reading. Accuracy ± 1.0% of the reading.